Compact ergonomic work surface adjusts from sitting to standing heights. 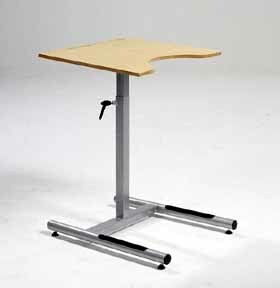 Although originally designed for classroom use, we think it is the best ergonomic laptop table around. Durable and attractive birch veneer table top. Body-socket surface shape wraps around you for proper support. Compact 28"L x 24"D desktop support paperwork or laptop use. Spring-assisted height adjustment locks into place with a hand lever. Heavy-duty base frame securely supports up to 280 pounds. Adjusts from 22" - 30"